Unlike the usual, this Parmigiana uses roasted zucchini and eggplant, mixed with a flavorful Gochujang red sauce. This vegetarian recipe can indeed be tasty and healthy— something your guests will remember you for. On a baking tray, lay out your eggplant and pumpkin slices. Drizzle olive oil over them, and season with salt and pepper. Roast them in the oven for about 3 minutes. Remove and put aside. Set your heat to medium. In a pot, add in your cooking oil, and when hot, put in your onions. Season with some salt to let the onions sweat. When the onions have caramelized and translucent in color and your garlic become fragrant, pour in your KNORR Tomato Pronto and Gochujang. Let it simmer until it starts bubbling. Add in your basil, oregano and brown sugar and mix until the sugar is dissolved. Season with pepper and KNORR Aromat Powder needed, give it a mix, then let it cool. Preheat the oven to 350°F. Grease a cast-iron skillet with Olive oil. Layer the roasted eggplant & pumpkin slices flat in the cast-iron skillet, occasionally spooning some sauce in between and over each layer. 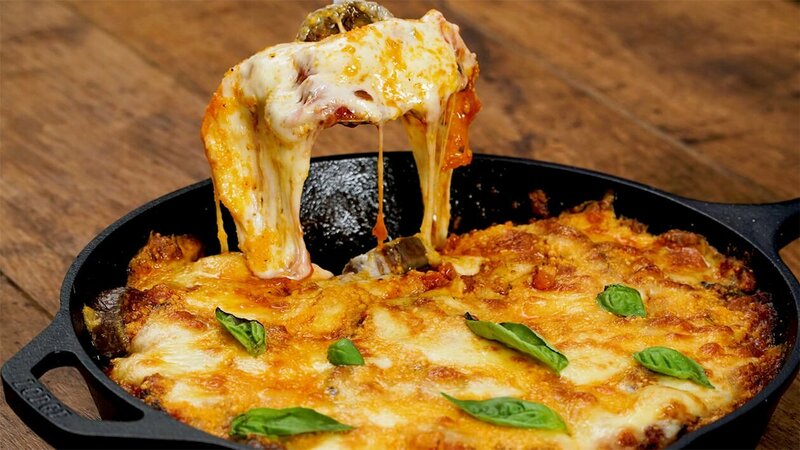 When the skillet is filled, sprinkle the Mozzarella and Parmesan Cheese over, coating the top evenly. Bake in the oven until the cheese melts and starts bubbling. Serve on the cast-iron skillet. Garnish with a basil leaf on top.